Mix all ingredients well. Will be thin. Grease 9 x 13-inch pan. Put wax paper on greased pan. Pour mix on wax paper. Bake at 350° for 15 minutes. When done, turn on dish towel while hot. Peel off wax paper. Roll long ways. 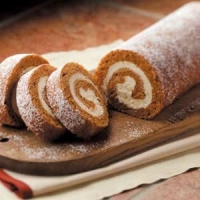 Let completely get cold and unroll.Filling:8 oz. cream cheese1/4 c. butter1 c. powdered sugar1/4 tsp. vanilla Mix ingredients. 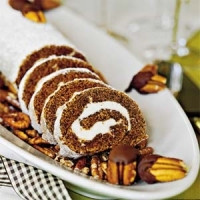 Put inside pumpkin roll and roll back up. Cut in half. Wrap in foil and freeze. Slice when frozen. 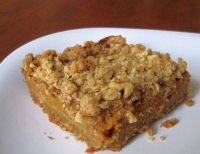 Recipe categories: Desserts, Holiday, < 30 mins.